The City of Lecompton was founded in 1854. It was originally called "Bald Eagle," but was later changed to Lecompton in honor of S.D. Lecompton, a federal judge of the territory. In 1855, the town became the permanent and only official capital of the Kansas Territory. President James Buchanan appointed a governor and officials to establish government offices in Lecompton, and construction began on an elegant capitol building, Lane University and Territorial Capitol Museum. The population of Lecompton reached 4,000 and was dubbed the "Wall Street of the West" by settlers, politicians and land speculators. There were seven four-horse drawn stages and express lines to Lecompton. As the town grew, so did the territorial conflict. The Battle of Fort Titus occurred in 1856. Charles Robinson, who was to be the first governor of the state of Kansas, was imprisoned in Lecompton and tried for treason. In the fall of 1857 a convention met in Constitution Hall and drafted the famous Lecompton Constitution, which would have admitted Kansas as a slave state. The happenings in the Kansas Territory caused a rupture in the relations of the North and South. There was constant conflict between the pro-slavery and free-state factions. Lecompton was considered the center of the pro-slavery movement, which of course was unsuccessful. Kansas entered the Union on January 29, 1861, as a free state, and the Civil War began. When the frame business buildings on the east side of main street (Elmore) were destroyed by fire in 1916, they were replaced with brick structures that are still in use. A mural depicting the town as it appeared before the fire is located in the local post office building. Lecompton has put aside its turbulent past and is now a delightfully quiet, pretty place and the people are proud of their part in the history of Kansas and the nation. This stone building was the headquarters of the Democratic Party during the Kansas Territorial period (1854-61). The cabin was used during a time when Lecompton, known as "The Birthplace of the Kansas Democratic Party,"
This building was started with an appropriation of $50,000 from the United States Congress to be the capitol of the State of Kansas. 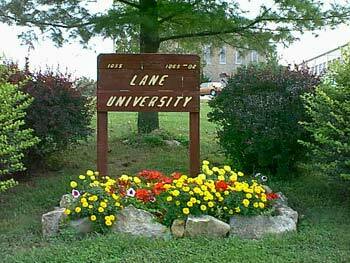 Later, it was finished as Lane University and was the site of the wedding of the parents of President Eisenhower.